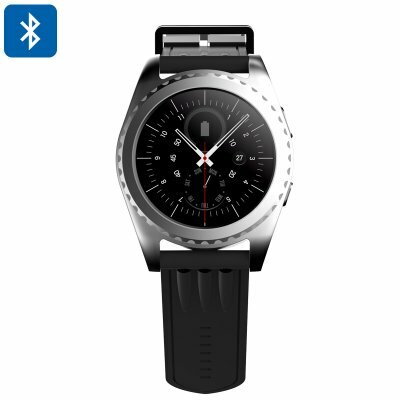 Successfully Added Bluetooth Smart Watch - 1.2 Inch Touch Screen, Phone Calls, Messages, Sleep Monitor, Pedometer, Heart Rate Monitor (Silver) to your Shopping Cart. With this Bluetooth smart watch, you’ll be able to enjoy all your phone’s features straight from your wrist. No matter where you are, with this Bluetooth watch at your side you’ll always stay conveniently connected to your friends and family. When paired with your smartphone, this Bluetooth watch instantly shows you incoming phone calls and messages that can be answered directly from its 1.2-Inch IPS touch screen display. Unlike a watch phone, this Bluetooth smart watch does not feature a SIM card slot but it still allows you to engage in hands-free phone calls through its Bluetooth support – bringing along great on-the-go connectivity. Besides allowing you to engage in hands-free phone calls and writing text messages, this Bluetooth smart watch can also be paired with your mobile music library – allowing you to listen to your favorite tracks at any time of the day. The watch is compatible with both iOS and Android smartphones, bringing along great efficiency no matter the phone you’re using. Featuring a pedometer and heart rate monitor, this sports watch is capable of providing you with accurate and detailed information on your previous exercise sessions. By analyzing your heart rate, steps taken, and distance covered this Bluetooth smart watch allows you to adjust your upcoming workouts according to your personal capabilities - guaranteeing that you’ll meet your fitness goals in the fastest and most efficient manner. It furthermore comes with a sophisticated sleep monitor that will make sure you get enough rest in between your workout sessions which will stimulate your muscle growth and recovery. With its stylish design, this smart watch can be confidently worn at any occasion. Whether you use it to make hands-free calls and to stay in touch with friends or family, or for its smart health and fitness features – this Bluetooth watch along with all its smart features is guaranteed to bring great efficiency. This Bluetooth smart watch comes with a 12 months warranty, brought to you by the leader in electronic devices as well as wholesale electronic gadgets..
Arabic: - مشاهدة بلوتوث الذكية - Chinese Simplified: - 蓝牙智能手表 - Czech: - Bluetooth Smart hodinky - Danish: - Bluetooth Smart Watch - Dutch: - Bluetooth Smart Watch - French: - Puce Bluetooth Watch - German: - Bluetooth Smart Watch - Hebrew: - שעון Bluetooth חכם - Hindi: - ब्लूटूथ स्मार्ट वॉच - Italian: - Orologio Bluetooth Smart - Japanese: - ブルートゥース スマート時計 - Korean: - 블루투스 스마트 시계 - Malay: - Jam tangan pintar Bluetooth - Norwegian Bokmål: - Bluetooth Smart Watch - Romanian: - Ceas Bluetooth Smart - Russian: - Часы Bluetooth Smart - Spanish: - Reloj Bluetooth Smart - Thai: - นาฬิกาบลูทู - Turkish: - Bluetooth akıllı izle - Vietnamese: - Bluetooth Smart Watch.